« How long does it take to set down your tweezers? I’ve talked about screwdrivers before and I’ve talked about sharpening stones. Today we’re going to put the two together. I recently received this beautiful screwdriver sharpener from a fine gentleman named John at VersaLab. This company isn’t known for their watchmaking tools but they have done a great job on this one. Before examining the tool, we’ll discuss screwdrivers for a minute, as we have in the past. Well shaped screwdriver blades are essential to the watchmaker. A well shaped tip greatly reduces the likelihood of the blade slipping and damaging the watch. A correctly prepared blade has two sides which are parallel which will contact the top of the screw slot and the blade will reach almost to the bottom of the slot without touching it. There are 2 main ways to prepare screwdriver blades. One method is to have concave cuts on either side of the blade so that the tip is essentially parallel. The second way is to have two flat angled sides that come to a near point. Variations are possible with both methods so that the grain of the cut is parallel to the length of the blade or parallel to the tip of the blade. I know watchmakers who swear by all of the above methods. I have always used screwdrivers with flat sides cut with the grain parallel to the length of the blade. One interesting item is that the reasons given for both directions of grain are the same, (supposedly it provides better grip). Some people prepare their screwdriver tips with a file, others with a stone, some use a grinding tool (necessary for concave tips) or a simple rolling tool. I’ve always just used a small stone to sharpen my screwdriver blades, but it has its downsides. 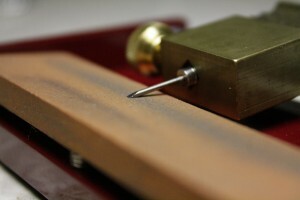 Using a stone requires the watchmaker to have the fine motor skills (as they should have anyway) to keep the blade flat and to align the two sides parallel. It can be easy to get slightly off and end up with a wedge shaped screwdriver. I have found the concave grinders to be clunky and cumbersome. The rolling sharpener is easy to use but it requires a large stone and you have to remove the screwdriver and re-align it to sharpen the other side (this presents the potential for not having two parallel sides. 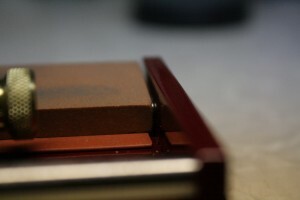 The sharpener from versalab is very easy to use and guarantees two parallel sides. Because of the way the carrier is designed once the screwdriver is fastened in place all you have to do is flip it over to sharpen the other side. The carrier will accommodate the full range of watchmaker’s screwdrivers with shaft diameters up to 5 millimeters. This is sufficient for Bergeon screwdrivers (with and without the ergonomic grip) from 0.5mm blade diameter up to 2.5mm blade diameter. I did not have the 3.0mm blade diameter to try but that largest size may not fit. The sharpener comes with a high quality Norton sharpening stone which can be set to different angles by loosening the set screws on the side and adjusting the vertical support screw. At first I received a medium grit stone which was too coarse for this job. Be sure you order it with a fine stone if you decide to get this tool, it made using the tool an almost thoughtless endeavor. The tool works so well with the fine stone that it has earned a place on my secondary bench for sharpening screwdrivers whenever I need to. If you keep the tool accessible it takes less than 30 seconds to install the screwdriver and sharpen both sides of the blade. It surely, is the best screwdriver sharpener on the market for flat blades. 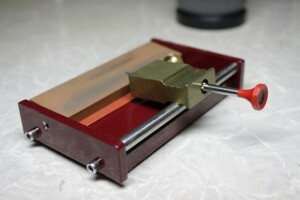 To learn more about the screwdriver sharpener you can visit the Versalab webpage versalab.com. This entry was written by Jordan Ficklin and posted on March 13, 2012 at 9:07 pm and filed under Tuesday Tools, watchmaking. Bookmark the permalink. Follow any comments here with the RSS feed for this post. Post a comment or leave a trackback: Trackback URL. The tool does appear to be nicely designed, and fast to use. I’d prefer to invest into a GRS Power Hone with that type of money, though. The angle guide it comes with requires manual parallel orientation, however I’m sure I could easily modify it or create something that would solve that issue. It’s also great for all types of other applications as well. As a watchmaker I always enjoy finding a new tool which can make work easier and/or better. The one from Versalab may have some advantages. First, the screwdriver can be tightened before sharpening so it doesn’t wobble. 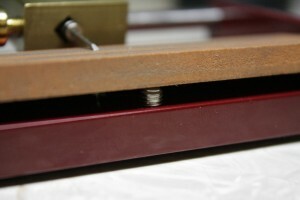 Second, one can visually see the angle of the blade on the stone. Third, the price is much cheaper than the ones made in Switzerland. I own the one shown under the Bergeon label but will order the Versalab as I always look to acquire the best types of tools. Coupled with a convex shaped stone, this has potential to make quick and simple work of honing hollow ground screwdriver blades. I didn’t quite get why you’d have to remove the screwdriver? Bergeon does a stone for this, set into a block of wood which the ‘wheel’ run on. This way the stone doesn’t need to be quite so large. There are so many different kinds of sharpeners. The ones illustrated in the link would not require you to take the screwdriver out of the sharpener to turn it over for the other side. The one I have does. A very interesting article, thank you. I was only aware of the very expensive Horotec tool. 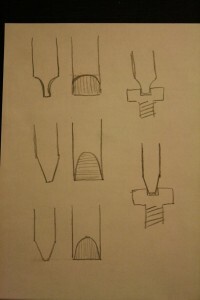 I use the simple method with the Bergeon roller described by J.Staines. It works well, is straight forward and quite inexpensive. I describe it on my french speaking blog here http://ateliermadman.com/horlogerie/outillage/affuter-un-tourne-vis/ You might use Google Translate, if necessary, to provide a translation into English. At the end of my article, I gave a link to yours, so the readers can discover both methods.